Take me out to the ballgame? Yes, please, and put me in the locker room too! 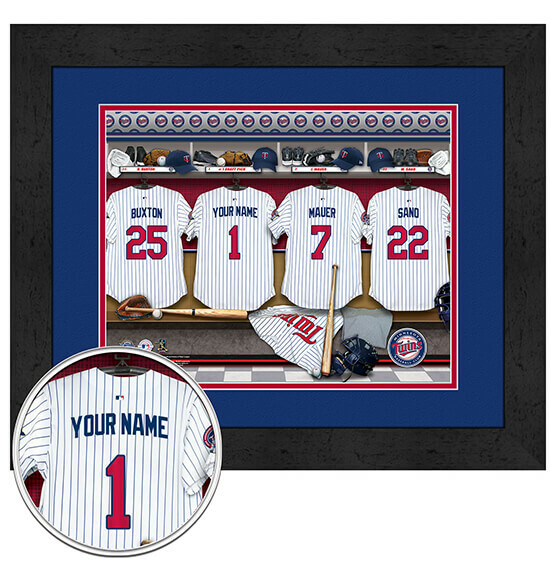 You can be part of the Minnesota Twins with our custom Personalized Locker Room Wall Art decor. Your name will be featured prominently on one of the four jerseys in this full-color charming locker room scene. This high-quality glass and MDF vinyl-wrapped framed print comes ready to hang with a sawtooth on the back. The digital double mat even features the Twins' team colors and logo. This memorable gift idea is perfect for the Major League Baseball and die-hard Twinkies fan in your life! Give them something they will cherish with PersonalizedThings by Exposures.